Jacqueline Winspear's marvelous and inspired debut, Maisie Dobbs, won her fans from coast to coast and raised her intuitive, intelligent, and resourceful heroine to the ranks of literature's favorite sleuths. 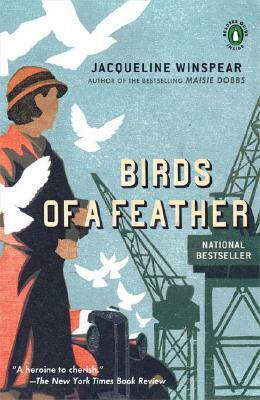 Birds of a Feather finds Maisie Dobbs on another dangerously intriguing adventure in London "between the wars." It is the spring of 1930, and Maisie has been hired to find a runaway heiress. But what seems a simple case at the outset soon becomes increasingly complicated when three of the heiress's old friends are found dead. Is there a connection between the woman's mysterious disappearance and the murders? Who would want to kill three seemingly respectable young women? As Maisie investigates, she discovers that the answers lie in the unforgettable agony of the Great War. Jacqueline Winspear was born and raised in Kent, in the south of England. In 1990, after a career in publishing in London, she moved to California."